Complex superconducting circuits with many elements, such as resonators, Josephson junction chains (see the figure on the right), transmission lines, can be routinely fabricated on a chip nowadays. Due to superconductivity, electromagnetic signals propagate in such circuits with extremely low losses, and the circuit properties can be tuned by applying an external magnetic field. Their numerous applications range from amplifiers and detectors to quantum information and metrology. In low-dimensional structures, the superconducting phase excitations (which are nothing else than the plasma oscillations) are gapless, in contrast to bulk superconductors, where the plasma frequency is finite (and usually quite high, a few eV). Thus, in low-dimensional structures at temperatures well below the superconducting gap (which is typically a few Kelvins) the dominant role is played by the phase excitations because the quasiparticles are frozen out. I am interested in the effect of spatial inhomogeneity on the phase excitations and its consequence for various physical phenomena which involve phase excitations (such as quantum phase slips). I closely collaborate on this topic with several experimental groups at the Néel Institute. D. M. Basko, "Landau-Zener-Stueckelberg physics with a singular continuum of states", Physical Review Letters 118, 016805 (2017) . D. M. T. van Zanten, D. M. Basko, I. M. Khaymovich, J. P. Pekola, H. Courtois, and C. Winkelmann , "Single Quantum Level Electron Turnstile ", Physical Review Letters 116, 166801 (2016). M. Taguchi, D. M. Basko and F. W. J. Hekking, "Mode engineering with a one-dimensional superconducting metamaterial ", Physical Review B 92, 024507 (2015). 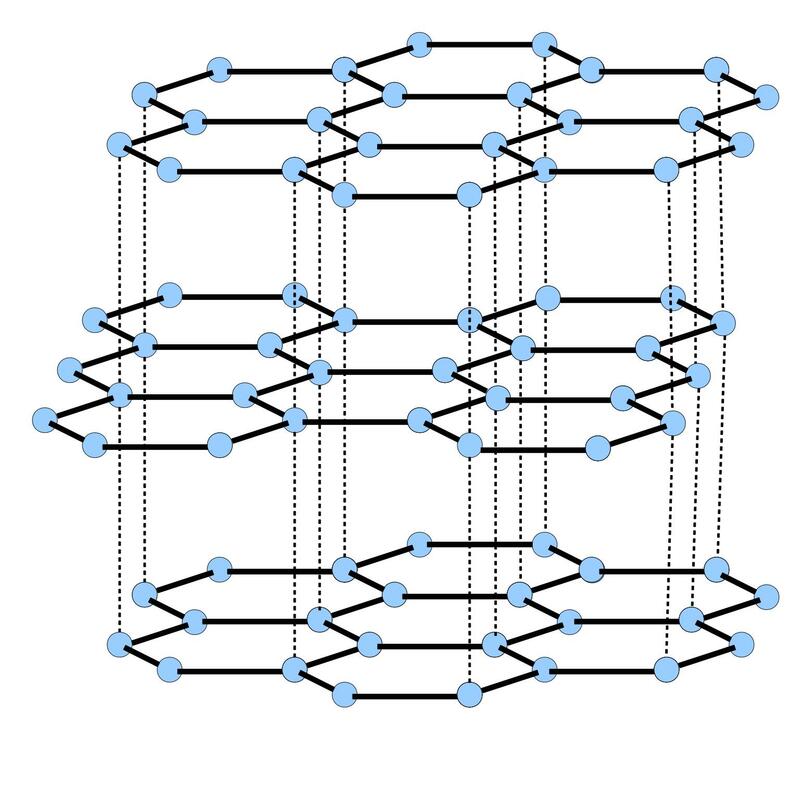 D. M. Basko and F. W. J. Hekking, "Disordered Josephson junction chains : Anderson localization of normal modes and impedance fluctuations", Physical Review B 88, 094507 (2013). P. Jung, A. V. Ustinov, and S. M. Anlage , "Progress in superconducting metamaterials", Superconductor Science and Technology 27, 073001 (2012). In a perfect crystal, electronic wave functions are the Bloch waves. The electron freely propagates through the crystal, and each wave function extends over the whole crystal. In a disordered crystal (e.g., due to impurities), it is natural to assume that random scattering on the impurities leads to the diffusive character of the electron motion, the disorder strength determining the diffusion coefficient. The wave functions are then randomly oscillating, but they still extend over the whole crystal. However, sometimes this picture turns out to be totally wrong, and one faces the absence of diffusion in certain random lattices. The electron, injected on one end of the sample, never reaches the other end ; the diffusion coefficient is exactly zero, and all transport is stopped. Everywhere in the crystal, the wave functions are localized with an exponentially decreasing envelope. This is called Anderson localization. It is an effect of quantum interference : the propagation is stopped even in the classically allowed region. In three dimensions it occurs at sufficiently strong disorder or near the band edges. In one dimension, all states are localized by an arbitrarily weak disorder. Anderson localization is a universal phenomenon, not specific to electrons in disorder. It has been observed for microwaves, light, acoustic waves, and ultracold atoms. It may occur for any wave trying to propagate through a disordered medium. Quantum mechanics is only needed to make particles behave like waves. Formally, one always studies eigenfunctions of a linear operator which contains Laplacian of some sort (differential or discrete), as well as some kind of disordered potential. 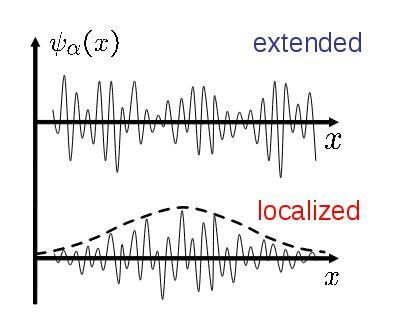 Anderson localization is reasonably well understood for non-interacting particles or linear waves. For nonlinear waves the superposition principle breaks down completely ; for interacting quantum particles it holds, but only in the many-body Hilbert space whose dimensionality is exponentially large compared to that of the single-particle problem. Thus, the formal set-up of the problem is completely different from the non-interacting/linear case. Moreover, it depends on the specific system. A relatively simple case is when the system is coupled to an external thermal bath (e. g., electrons coupled to phonons). The bath provides noise which destroys coherence, necessary for Anderson localization. Then the localization is destroyed, and transport is allowed. But what happens if there is no external bath, just intrinsic interaction between particles or nonlinearity present in the medium ? Will the particles be able to propagate ? My fascination with the subject comes from the very basic question, underlying the whole statistical physics : how does a system, governed by the reversible Hamiltonian dynamics (whether classical or quantum), irreversibly reach the thermal equilibrium ? Indeed, a localized non-interacting/linear system never equilibrates : the particles will simply sit in their localized states forever. It is only interaction/non-linearity that may (or still may not) lead to non-trivial kinetics, which results in equilibration and transport. Besides this fundamental interest, the problem is quite challenging from the technical point of view, and requires development of new theoretical tools. D. M. Basko, "Kinetic theory of nonlinear diffusion in a weakly disordered nonlinear Schroedinger chain in the regime of homogeneous chaos", Physical Review E 89, 022921 (2014). D. M. Basko, "Weak chaos in the disordered nonlinear Schrödinger chain : destruction of Anderson localization by Arnold diffusion", Annals of Physics 326, 1577–1655 (2011). D. M. Basko, I. L. Aleiner, and B. L. Altshuler, "Metal-insulator transition in a weakly interacting many-electron system with localized single-particle states ", Annals of Physics 321, 1126–1205 (2006). R. Nandkishore and D. A. Huse, "Many-Body Localization and Thermalization in Quantum Statistical Mechanics", Annual Review of Condensed Matter Physics 6, 15–38 (2015). Graphene is a two-dimensional layer of tightly bound carbon atoms arranged in a honeycomb lattice. Weakly bound graphene layers form a three-dimensional crystal of graphite. Since 2004, when the first graphene monolayers were obtained, the same techniques were applied to other layered materials to separate individual layers. Nowadays, 2D materials form a rather diverse family. Besides graphene (a semimetal), I am interested in semiconductor transition metal dichalcogenides. Electrons in such materials are most often probed either by transport measurements (i.e., one attaches contacts to the sample and measures current), or by optical spectroscopy (one shines light on the sample and analyzes the light that comes out). Absorption spectroscopy (measurement of how much light is lost in the sample) probes excitations of the crystal with energies corresponding to that of the incident photons. typically, electron-hole pairs. Raman spectroscopy (measurement of how much light comes out at frequencies different from the incident frequency) probes excitations at lower energies, and can detect electronic excitations, as well as phonons. Raman spectroscopy can also give information on electron-phonon coupling. Application of a magnetic field to the sample provides an additional degree of freedom for probing electronic properties. Indeed, instead of the continuous band, electronic spectrum in two-dimensional systems shrinks into a sequence of discrete Landau levels, so all optical transitions are modified. Magneto-absorption and magneto-Raman measurements detect how exactly they are modified, and provide additional information on electrons, phonons, and their interactions. In order to interpret the measurement results and extract the useful information, one needs a good theoretical understanding of the optical properties. Two-dimensional materials often have quite simple structure with high symmetry, so that many phenomena can be described by simple models whose parameters are well known and calculations can often be done all the way to final numbers which can be compared to experiments. Indeed, I have benefited a lot from collaborations with experimental groups of Marek Potemski at the Laboratoire National des Champs Magnétiques Intenses in Grenoble and of Andrea Ferrari at the Department of Engineering in Cambridge University. A. O. Slobodeniuk and D. M. Basko, "Spin-flip processes and radiative decay of dark intravalley excitons in transition metal dichalcogenide monolayers", 2D Materials 3, 035009 (2016). C. Faugeras, S. Berciaud, P. Leszczynski, Y. Henni, K. Nogajewski, M. Orlita, K. Watanabe, C. Forsythe, P. Kim, A. K. Geim, D. M. Basko, M. Potemski, " Landau level spectroscopy of electron-electron interactions in graphene ", Physical Review Letters 114, 126804 (2015) . D. M. Basko, "Theory of resonant multiphonon Raman scattering in graphene", Physical Review B 78, 125418 (2008). A. C. Ferrari and D. M. Basko, "Raman spectroscopy as a versatile tool for studying the properties of graphene", Nature Nanotechnology 8, 235 (2013). K. S. Novoselov, "Nobel Lecture : Graphene : Materials in the Flatland, Reviews of Modern Physics 83, 837 (2011). When two small objects are separated by a few nanometers, their electronic excitations can couple to each other via Coulomb interaction even in the absence of any electric contact. Thus, even if the charge transfer between the two objects is completely blocked, the energy can still be transferred. This can be viewed as an electron-electron collision where the two electrons resides on different parts of the structure. When the spatial separation is not too small, such process can go via emission and reabsorption of a photon. If the separation is much smaller than the photon wavelength at the relevant frequency, it is the instantaneous Coulomb interaction that dominates the process. Because electric contact is not required for this processes, the two subsystems can be of of the same or of quite different physical nature : two organic molecules (Forster transfer), two pieces of metal, a semiconductor and an organic material. I find energy transfer fundamentally interesting because it is a purely interaction effect, it cannot be described in a model of non-interacting electrons. From the practical point of view, it may be used to pump energy between different parts of the structure. Conversely, it may be an important mechanism of unwanted heat leakage at low temperatures, when phonons are frozen out. V. M. Agranovich, D. M. Basko, and G. C. La Rocca, "Efficient optical pumping of organic-inorganic heterostructures for nonlinear optics", Physical Review B 86, 165204 (2012). D. M. Basko, F. Bassani, G. C. La Rocca, and V. M. Agranovich, "Electronic energy transfer in a microcavity", Physical Review B 62, 15962–15977 (2000). D. Basko, G. C. La Rocca, F. Bassani and V. M. Agranovich, "Förster energy transfer from a semiconductor quantum well to an organic material overlayer", European Physical Journal B 8, 353–362 (1999). V. M. Agranovich, Yu. N. Gartstein, and M. Litinskaya, "Hybrid Resonant Organic–Inorganic Nanostructures for Optoelectronic Applications", Chemical Reviews 111, 5179–5214 (2011). A. I. Volokitin and B. N. J. Persson, "Near-field radiative heat transfer and noncontact friction", Reviews of Modern Physics 79, 1291–1329 (2007).